Have you ever met a man, woman or child who doesn’t like risotto? I haven’t. I do know a lot of children who don’t like kale however, so this one was just for hubby and me. 1) Roast the tomatoes on a baking tray with olive oil, salt and pepper, and about 3 cloves garlic (whole and in their skins) in a hot oven for 15 minutes. About 375F or 400F. 2) Melt the butter in a heavy bottomed pot and gently cook the chopped onion, celery and 1 clove of sliced garlic. Cook on a low heat until onions and celery are translucent and soft–about 10 or 15 minutes. 3) Add the rice and stir, coating with butter. Add more butter if you need to. Risotto=butter. Then add the wine and turn the heat up a little to cook off the alcohol. 4) Ladle in the stock a little at a time, stirring and cooking down, and then ladling in more. Or you can dump it all in, turn the heat down low, cover the pot and stir it occasionally. This is more of the Jamie Oliver risotto method. I have tried both methods and I tend to use the Jamie Oliver way as I’m not trying to impress my husband or my kids. 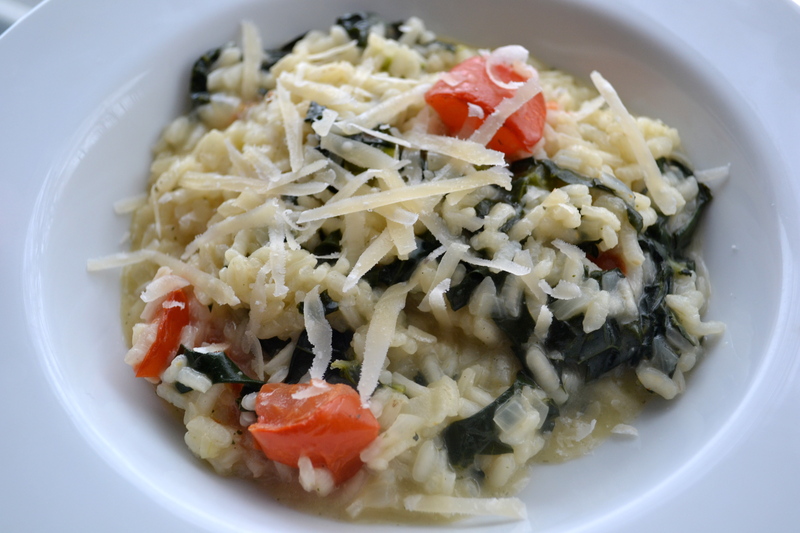 I just want to make a yummy, creamy, tender and chewy risotto! If you are not a risotto master, then you must be careful to a) stir often, and b) keep an eye on the liquid and add more as needed. Risotto should be starchy, creamy and wet. Dry, overcooked rice is NOT risotto. 5) While the risotto is cooking, wash and chop the kale (stems are fine to be left in) and then simmer in a pot with a cup of water till tender. A bit of chew and texture is nice so don’t overcook the kale to mush. Squeeze the excess water out of the greens and set aside. Reserve the cooking liquid and add to the risotto rice as needed. This way you are not wasting any nutrients from the kale water. 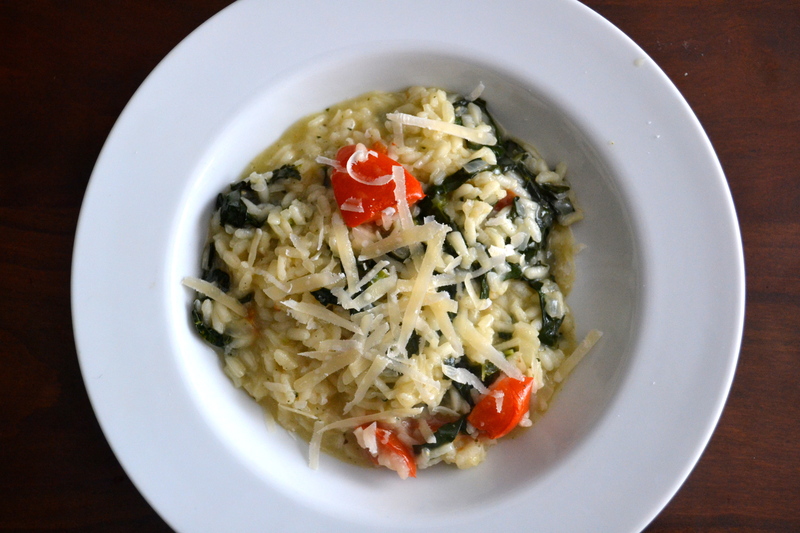 6) When the risotto is cooked but still chewy, fold in the kale and roasted tomato. You can also add the roasted garlic or discard. Up to you. The risotto is finished when the rice is fully cooked but just a bit chewy and there is still plenty of thick risotto liquid in the dish. If it seems a little dry at any point, add in a little more stock. 7) Season with salt and pepper to taste and shredded parmesan. I thought this barely needed any cheese at all. To veganise it simply leave the cheese out altogether.